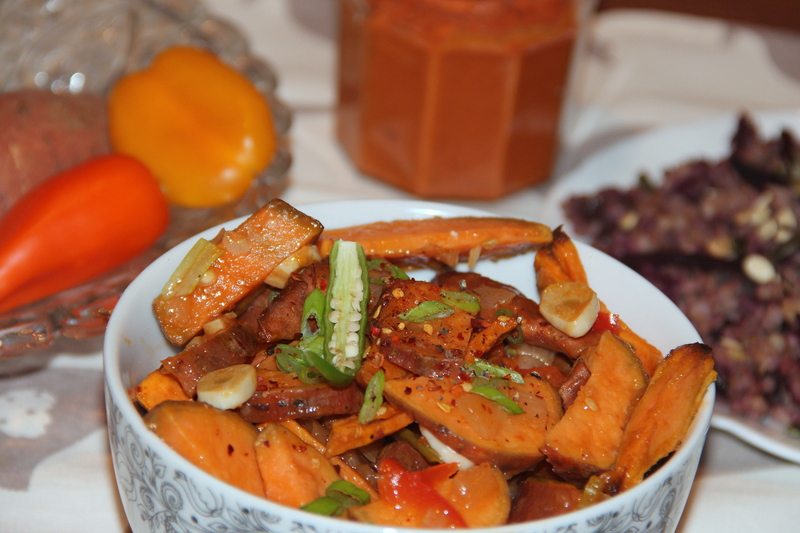 This is a side dish where the roasted sweet potatoes are coated in spicy and hot chilli sauce. The chilli sauce is similar to that of schezwan sauce but i used tomato chilli with personalisation of taste. As a variation roasted sweet potatoes than frying. This dish makes a great side dish with any indo-chinese fried rice or noodles. Pre-heat the oven at 200deg c, line the baking tray with parchment/baking sheet and set aside. Drain and drain water from sweet potatoes and pat dry on the kitchne towel. Heat oil in the wok add onions, bell peppers, green chillies, ginger and garlic and stir fry on a high heat for a minute or two. Add the soy sauce, red chilli sauce, salt, vinegar stir . Now add corn starch-water mixture and chopped celery simmer for few more minutes til the sauce begins to thickens. Finally add roasted sweet poatoe wedges, toss them well in sauce until coated well. Garnish with spring onion greens, chopped celery and serve with any fried rice/noodles. Spices can be personalised, if you don’t like hot feel free to reduce the quantity of chillies and just use chilli sauce. I haven’t used any oil for roasting sweet pototoes, feel free to include if desired. Posted on November 12, 2014, in Indian, Side dish. Bookmark the permalink. 23 Comments. It’s a nice idea serving these with a spicy sauce. I had never though of that combination (probably because they are sweet), but actually it sounds delicious. Looks very yummy! I will have to try to make it :-). Really yummy i LOVE that chili sauce. How wonderful to have on the potatoes.